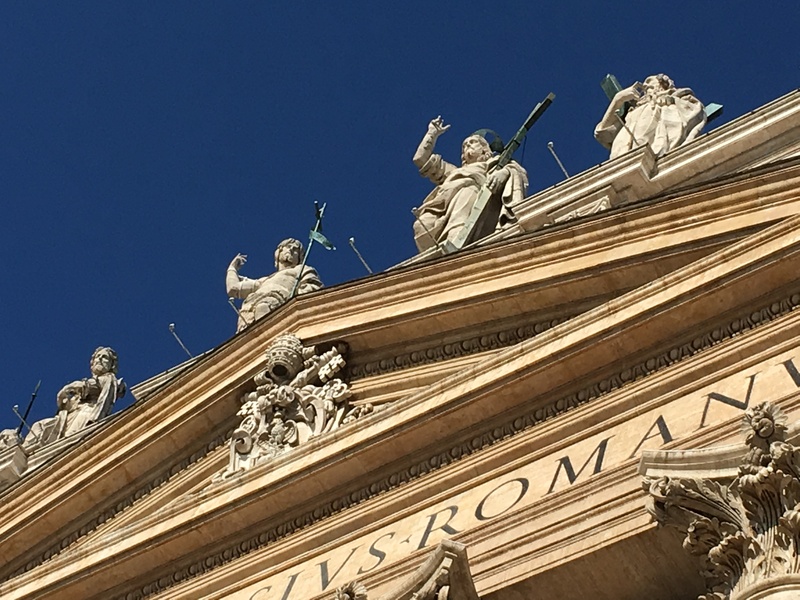 Rome in June is notoriously hot. 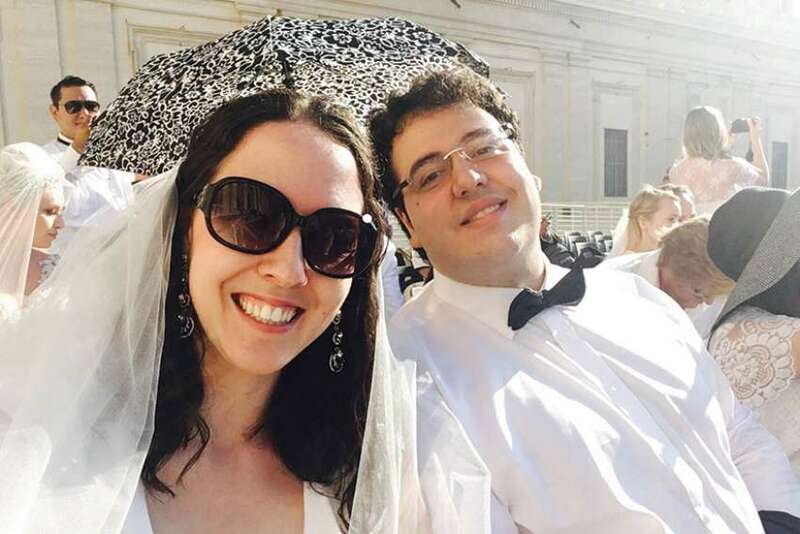 But Rome in June wearing a wedding veil is even hotter. 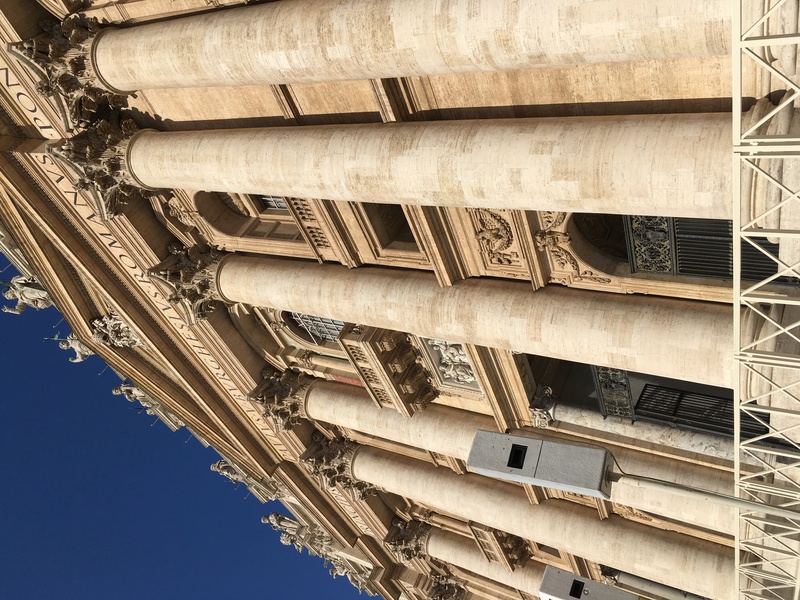 Seated to the left of the stage at Pope Francis’ weekly general audience, we could see him above a crush of parasols, umbrellas and wide-brimmed sun hats. There was no breeze, only a collective whir from sun-soaked newlyweds furiously fanning each other. I had no idea that a short time later I would be holding the Pope’s hand. Time crawled by as we waited for the audience to begin and the morning temperature fast approached 30 degrees. Three hours after we arrived in the piazza, the reading began. It was translated into several languages and focused on the example of the saints. When the general audience ended, some of the newlyweds started to form a line. 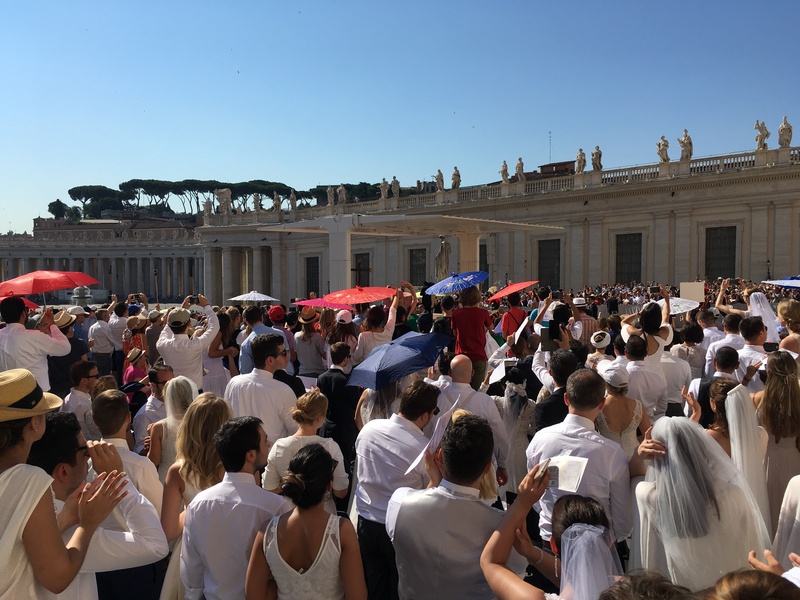 The opportunity for an individual blessing or a chance to be close to the Pope largely depends on how many newlyweds are in attendance and how busy the Pope is on a particular day, as I was told when calling to book the tickets. With so many excited couples in the square, we figured it was a longshot, yet we shuffled into the queue with high hopes. The line led us to steps behind the stage and, after waiting about 20 minutes, we could see the Pope making his way towards where our group was gathered. As he got closer, Daniele and I rehearsed a few words we’d prepared just in case we got a chance to speak with him. The Pope is always asking his flock to keep him in their prayers, so we wanted him to know we were with him and to encourage him to keep up his good work because his daily actions embody the Gospel values of love, justice and love of neighbour — to name only a few. 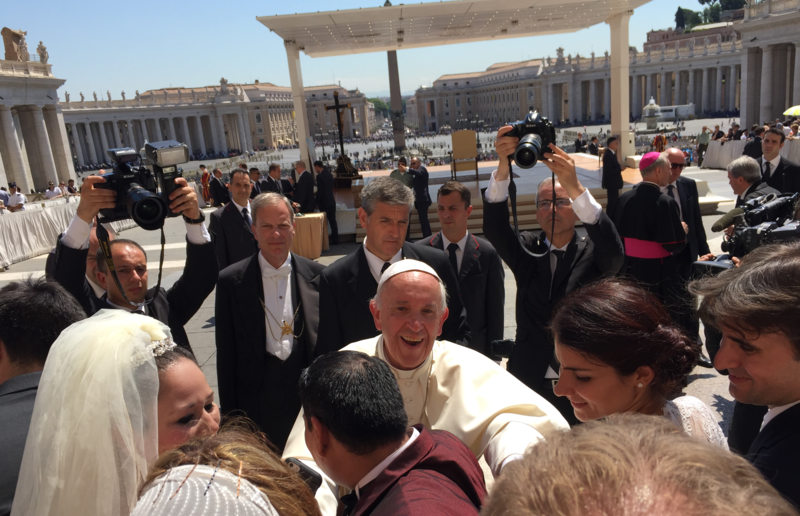 As the Pope arrived in front of our group, a space in front of me suddenly opened up. It wasn’t big enough for me to squeeze into the front row but, instinctively, I reached out and, wondrously, I was holding his hand through the crowd. No word of a lie, time seemed to stop. Then I heard Daniele excitedly urging me to share with Pope Francis the words we had prepared. The chatty newlyweds around us were suddenly silent. He held my hand but I was still a couple of feet away from him. He was smiling at me. It felt too impersonal to just shout out. I hesitated. So much for our script. Still, I’d like to believe he heard me and that his smile widened slightly as a result, but all I know for certain is that I was fighting back tears of joy. The rest was a blur. I let go of his hand, then found myself holding it a second time before he continued to make his way among the couples. To say I felt his presence is an understatement. His friendly demeanour is humbling to experience and witness firsthand. His beaming, infectious smile made Daniele and I feel that he was genuinely happy to see us all. We couldn’t stop smiling. Walking back through the crowded streets amidst shouts of “Auguri, sposi!” (“Congratulations, newlyweds”) — since we hadn’t made a wardrobe change — we picked up a panino and pizza and took a cab back to our hotel. The experience was surreal. It was time for a siesta. This entry was posted in Recent Work and tagged Catholic, General Audience, marriage, newlywed blessing, newlyweds, Pope Francis, Vatican by vksantilli. Bookmark the permalink.